It’s our old friend the “cyclists please dismount” sign placed at a road works site. 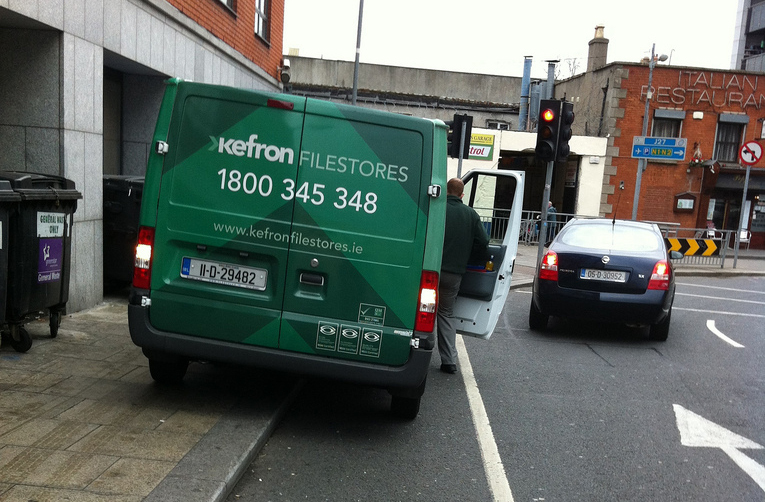 Yes, because every time a cycle lane is been driven in, or otherwise blocked, cyclists need to dismount. So, Dublin City Council needs to buy a permanent version of the above sign for that cycle lane, as it’s often blocked by trucks loading and taxis off loading passengers. 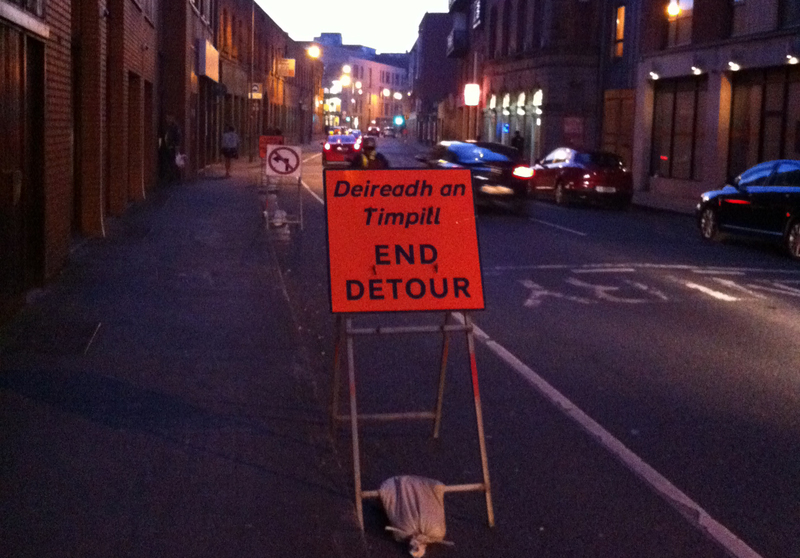 …but, in this case, they forgot the dismount sign!? Can we have a campaign to make this sign illegal as it discriminates against some road users clearly on their mode of transport. 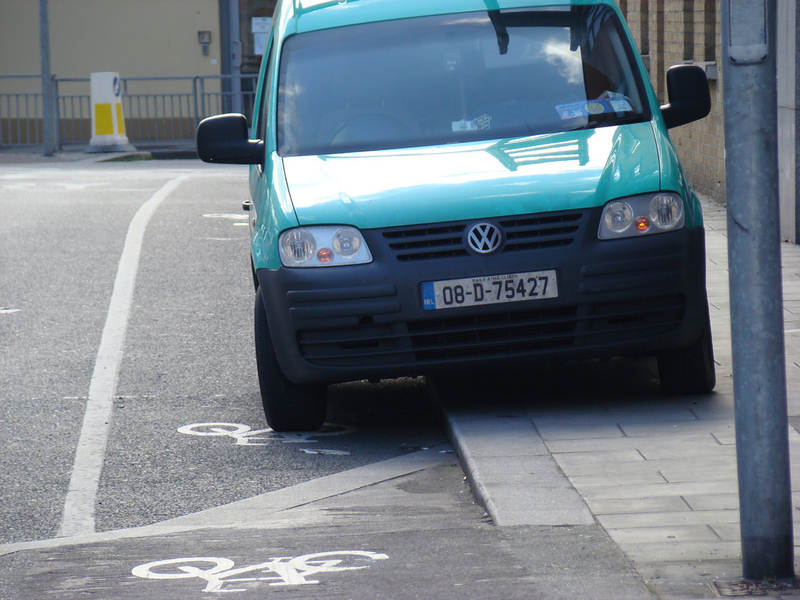 What about outside Fairview Pk on the shared use Cycle and pedestrian path.which on most days now has cars and vans parked on it. It is particularly bad on weekends especially on sunny days,on saturday and sunday it was chockers with cars and some vans, also on Match days in Croke Park it is very bad.Nobody in the Police seems to mind one bit about this. Guys, the decision makers in the County Councils, along with other arms of the state don’t care about cyclists. They talk the talk but they seldom walk the walk (or cycle the cycle for that matter). I would love to challenge the county councils to live up to their policies. DLRDCoCo have a lovely Cycling Policy document. Section CP 2.6 Page 13, Cycle / user Audits is worth a look. The Hierarchy of Measures shows the last option as “shared usage” for pedestrians and cyclists. Yet it is often the first chosen. 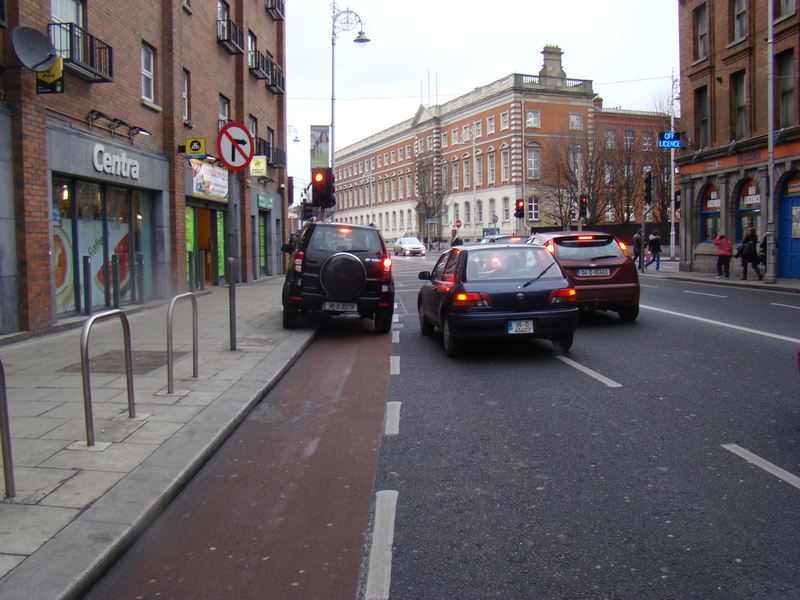 The “5 Key Principles” on page 14 includes a reference to Coherent and Direct Cycle routes. Yeah right. Have you tried to get from Lower Georges Street in Dun Laoghaire to Upper Georges Street? On page 17, in the last paragraph from section 2.6, reference to “The choice of surfacing materials” is made. Yet potholes and NEW cobble stones are commonplace. CP4.1 makes reference to cycle friendly routes to schools etc. This only really works if you drive your car to school. 12.2 makes reference to Speed limits. The ultimate “a la carte” choice of the Irish Motorist. To obey or not to obey, that is the question? However, CP15.1 makes reference to “on the spot fines” for legal infringements by cyclists. After my last conversation with a member of Án Garda Siochana, I can see this being the only item being enforced, See also CP16.1. Section 18.1. makes reference to “in-house cycle training”. Now I would like to see some decision makers from our Council on the road on bikes. It’s an election year, ok it’s only Council elections, but it’s the councilors that set policy. Make your vote count, only vote for pro cycling councilors.